Marc Lobliner’s newest supplement, Vasky, is a stim-free, flavorless pump pre workout making it the ideal addition to whatever your preworkout stack may be! The Machine, Marc Lobliner, is back with a new addition to his ever growing MTS Nutrition series line of supplements. 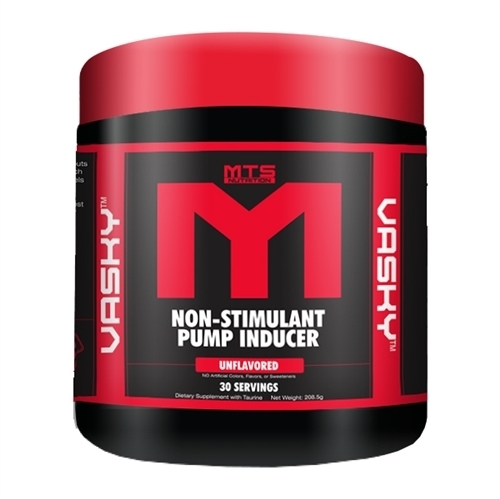 MTS Vasky is an unflavored, stimulant free pre workout product, making it perfect to stack with whatever you choose (ideally you’d stack it with MTS Clash). As with all of Marc’s products, there are no useless ingredients crammed into Vasky. Just proven and effective ingredients allowing you get the best bang for your buck when it comes to deciding which supplement to purchase. Vasky’s profile is simple and straightforward: Four simple, yet highly effective ingredients all designed to take your pumps from swole to skin-tearingly painful! It has the potent combination of nitric oxide pumps alongside water-based pumps for a killer one-two punch, especially when you stack this with another top pre workout supplement! Scanning the label, you might wonder why there’s no Agmatine included as this has become the golden boy in the pump supplement market. Well, MTS Clash along with most other pre workouts on the market have started included Agmatine as part of their formulas. 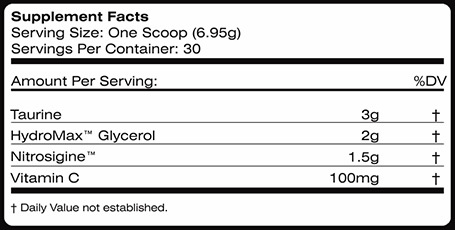 Vasky’s ingredient label is short and straight to the point, packing big doses of proven ingredients. Taurine is a conditionally essential amino acid. Meaning your body can synthesize it one its own, but it can also be obtained through the diet with the best sources being meat and fish. It is one of the most abundant amino acids in the body with large reserves stored in the brain, heart, and muscles. The reason it’s considered “conditionally” essential is that during periods of intense exercise, the body can’t synthesize enough to keep up with the body’s demands. For this reason, Vasky includes a heft 3g dose of taurine to make sure your stores are always at optimal levels. With such a high concentration of it in the brain, it should come as no surprise that taurine enhances mental focus. It also acts synergistically with glycine and BCAAs to reduce muscle soreness. More importantly though, it functions as a cell volumizer, bringing water and nutrients into the muscles. Recent research has also shown taurine to reduce symptoms of the dreaded delayed onset muscle soreness (DOMS). In addition to enhancing your pump, Vasky will speed your recovery allowing you to get back in the gym the next day and not have to take a “rest” day! Hopefully this isn’t your first time coming across HydroMax™. In case it is, HydroMax™ is a concentrated form of powdered glycerol (65%). This means it 65% glycerol, which is a major step up compared to the old glycerol stalwart, glycerol monostearate, which was only 25% glycerol and 75% saturated fat! HydroMax™ has become extremely popular in stimulant-free pre workout supplements lately in part for its ability to drive water into muscle cells. This leads to an incredible pump for your muscles. Additionally, endurance athletes used it as a hyper-hydration agent. [5,7,8] While we’re all after an insane pump (especially on arm day! ), Hydromax™ works synergistically with taurine to increase cellular hydration. All this results in increased cell volumization, better endurance, and BIG PUMPS! 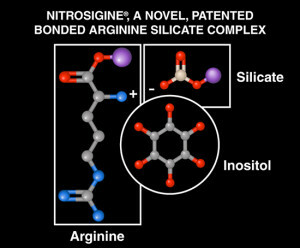 Nitrosigine™ is a trademarked ingredient from Nutrition21, and is a rather novel form of the age old N.O. booster, Arginine. 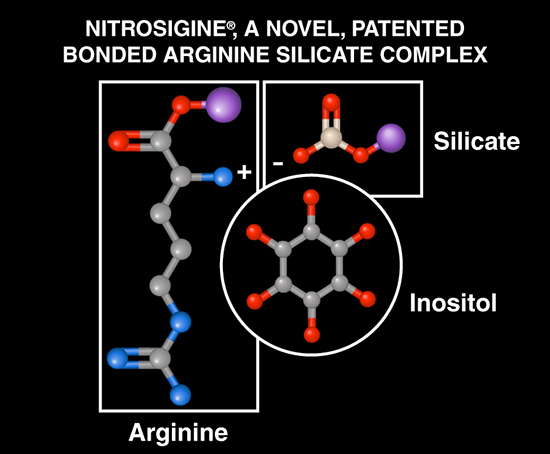 What Nutrition21 has done is bond arginine to silicate to increase the bioavailability of arginine. Research in 2014 that utilized this form of arginine showed nitric oxide levels were immediately boosted after taking it. But what’s unique to Nitrosigne is that it increased baseline N.O. levels, meaning it keeps those levels elevated for a period of up to two weeks and lead to further long term benefits! This ingredient is slowly working its way into more and more products; however the dosage used by the competition are mere dustings with amounts ranging from 325mg to 750mg. Vasky isn’t messing around by including a whopping 1.5g! Additionally, Vitamin C decreases the rate of perceived exertion during exercise, allowing you to continue to crush it in the weight room and watch those muscles get vasky! This may come as a shock to you, but MTS Vasky comes in only one flavor and that flavor is… UNFLAVORED! Marc did this intentionally so that you can toss it into whatever your pre workout stack or concoction may be and not have to worry about creating some horribly disgusting tasting drink. 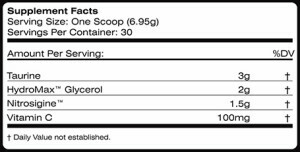 MTS Vasky will retail for under $20 per 30 serving tub, reportedly, which gets it well under the $1/scoop benchmark we normally see for pre workout supplements. That’s what we’re talkin about – Lobliner gets it! When this finally does hit the store shelves, you can be sure we’ll be all over it with the best price and place to find it, and you can sign up for price drop alerts in the widgets above and below. More value from the man who brought you the high-value MTS Whey Protein! Don’t forget about our exclusive coupons! Also note that PricePlow will be the best place to get Vasky, since we have exclusive one-time-use site-wide coupons to the stores that carry MTS, including our Tiger Fitness Coupon! Grab a tub of Vasky if you’re ready to experience skin-tearing pumps and never-before-seen vascularity! 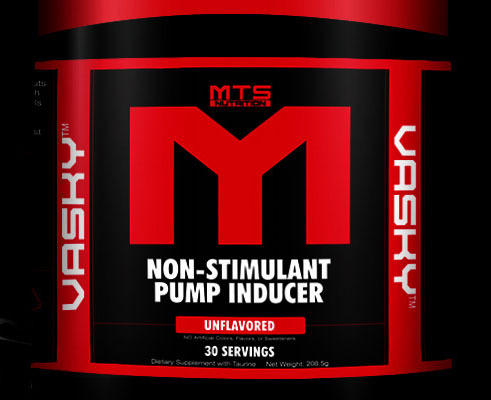 MTS Vasky is a no-nonsense, effectively dosed pre workout pump product. It’s flavorless and stim free making it the perfect addition to whatever you feel like stacking it with in your current stimmed pre workout arsenal. Marc Lobliner certainly didn’t mess around with the formulation here and just sprinkle in a bunch of N.O. boosters. He’s using some of the latest and greatest ingredients in the pump market all with serious dosages. Grab a tub and get ready to feel VASKY! Stay up to date with PricePlow! Sign up for price drop notifications by clicking Monitor this Brand on our MTS Nutrition page. If there’s ever a price drop, our system will catch it. Stay on the lookout for site-wide supplement coupons, which includes our Tiger Fitness coupon. This is when you can load up. To catch these, be sure to Like us on Facebook and Follow us on Twitter. 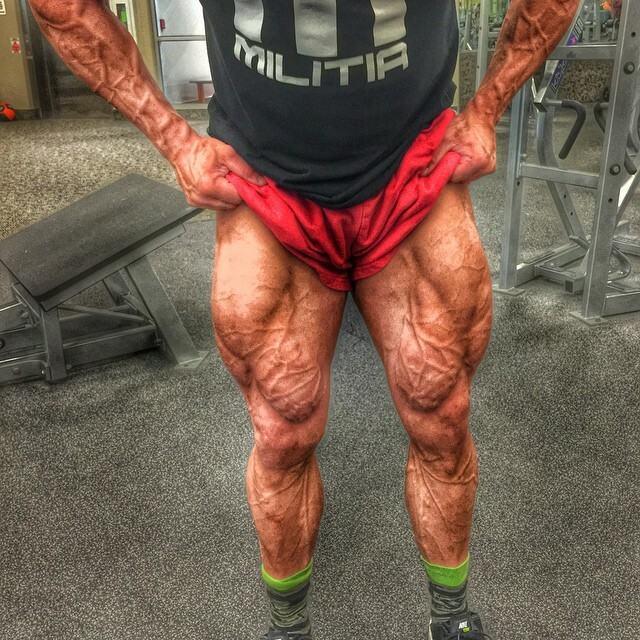 Either way, your link to MTS Nutrition’s Vasky is below. Grab a tub today and get ready to get VASCULAR! No Comments | Posted in New Products, Supplement News | Tagged Amino Acids, Arginine Silicate, HydroMax, Marc Lobliner, MTS Nutrition, Nitric Oxide, Nitrosigine, Stimulant-Free Pre Workout Supplements, Taurine.